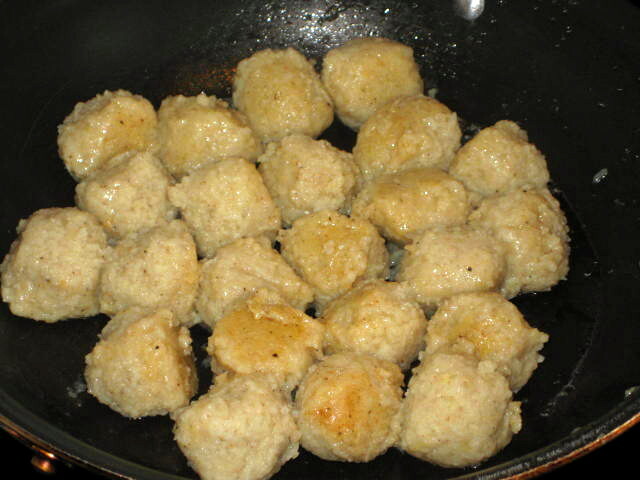 Potato dumplings are somewhat similar to Gnocchi in that main ingredients are potato, flour and egg except these dumplings are made either with grated raw potatoes entirely or cooked and raw combined. Also, some use only flour as a binder while others use only farina (cream of wheat), then there are recipes that use both in all sorts of proportions. 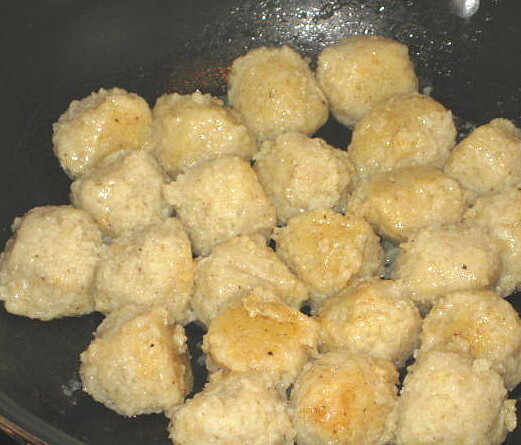 There are literally hundreds of recipes in Czech Republic for potato dumplings. Every region, city, village and family has their own. Actually, I think that same is true about any peasant dish in any culture. Since I’ve been making gnocchi for a while now and am comfortable with potato based dough I came up with my own version. Peele and rice cooked potato in food mill. You can grate cooked potato using box grater or, to be more rustic put it in heavy plastic bag and smash it with heavy frying pan J. 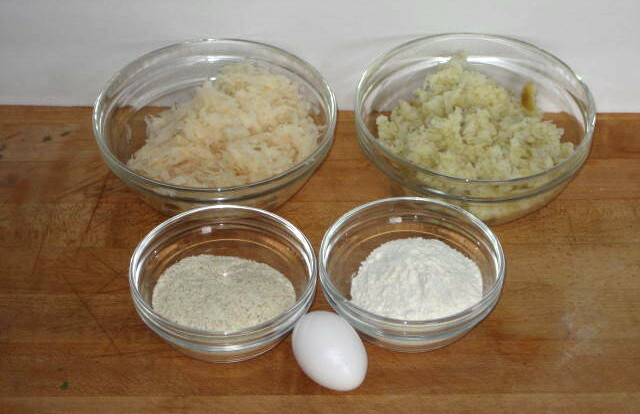 Mix raw and cooked potatoes together with the beaten egg. Sift together farina, flour, salt, pepper and baking powder and fold in potato mixture. 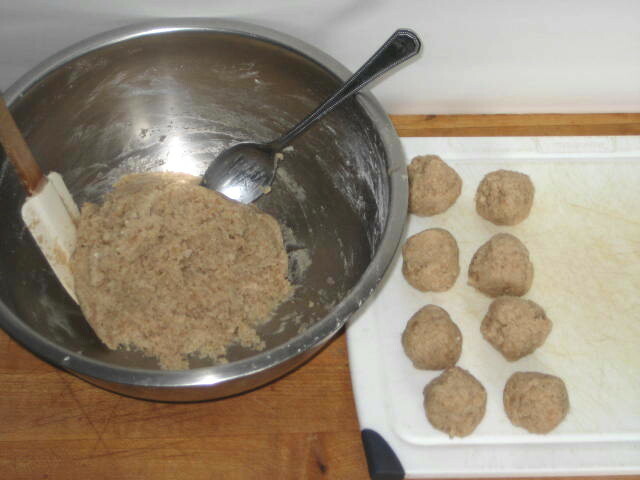 The dough should be stiff enough to form a small ball. Bring salted water in a large pot to roiling boil. 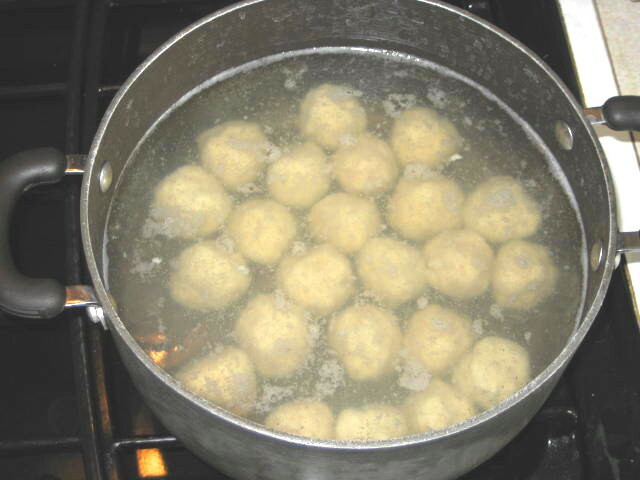 With soup spoon form balls little smaller then golf ball. When all dumplings are ready drop them gently into boiling water. Dumplings should loosely cover the bottom in one layer. When water comes back to boil lower the temperature to gentle boil. 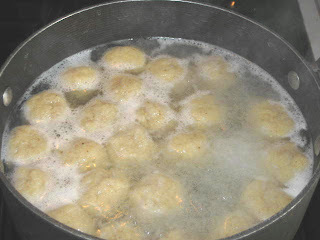 Release dumplings that stuck to bottom of a pot and boil for 15 minutes. When done, remove with slotted spoon to preheated frying pan with some bacon fat or lard and coat lightly. Sprinkle with dry toasted bread crumbs and serve. Potato dumplings are traditionally served with sauerkraut and smoked meat. Once on surface boil for 15 minutes. Drain and fry in bacon fat.